Where does your imagination take you when you think about NewZealand? Yes, but we didn’t see any playful Hobbits this trip. However, we did see crystal clear rivers, deep gorges, emerald green grassy-covered hills, brilliant blue-ish purple lupins and more. 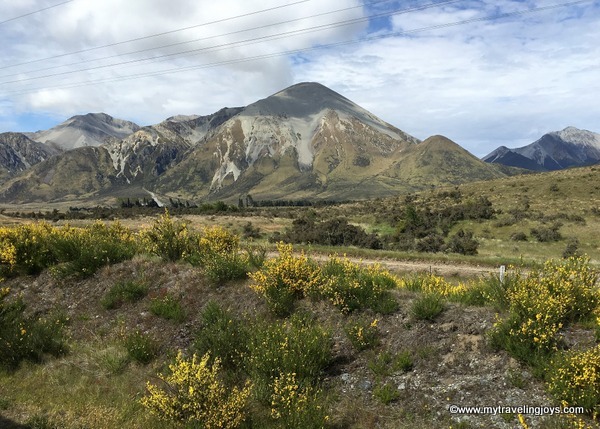 We couldn’t resist taking the 4.5 hour TranzAlpine Scenic journey, which travels from Christchurch to the small town of Greymouth, located on the western coast. Hubby loves trains, so we decided to pick up a rental car on the other side to continue our road trip. 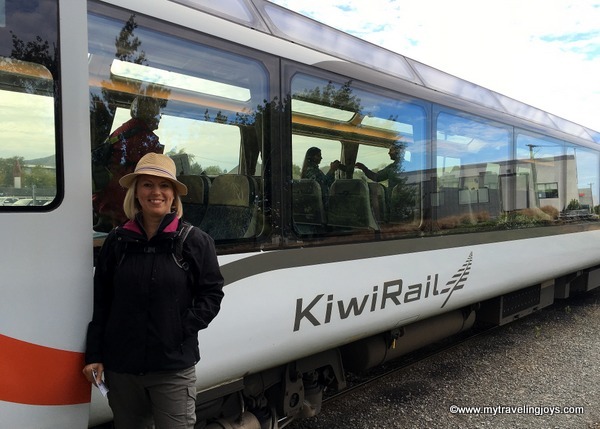 The KiwiRail website describes this trek as “one of the world’s most famous train journeys”, and we certainly cannot disagree! Hopefully, my photos will be enough to showcase all the natural beauty we saw along the way. At 8:15 a.m., we departed Christchurch. Even the though the station was crowded, the KiwiRail staff were quite efficient and quickly directed passengers to their reserved cars. First, our journey took across the Canterbury Plains, which covers 750,000 hectacres, making it NZ’s largest area of flat land. That’s where we saw lots of sheep! Then, we passed numerous fields of the beautiful Russel Lupins, which I just learned are considered a noxious weed by the NZ Department of Conservation. Unfortunately, these pretty wildflowers can clog up the rivers, thus altering the land where wading birds usually feed. But if you want to see them in bloom, the peak season is generally from November to December on the South Island. One of my favorite parts of the trip was hanging out in the open-air train car. Luckily, our seats were quite close to one of these cars as they can get quite crowded. Since we traveled in mid-December, the weather was a little chilly (highs in low teens C/about 50F) and people tended not to hang out in the car for too long. However, I tried to brave the blustery winds, set my camera to sports mode and took as many photos as I could as you can see here. Throughout the ride, the ice-fed Waimakariri River, which is the largest of the North Canterbury rivers, flowing for 151km from the Southern Alps to the Pacific Ocean, was our constant companion. I’ve never seen water so pure as this from a distance! We passed over several viaducts and through tunnels as we went through these mountain ranges. Around the 3-hour mark, we briefly stopped at Arthur’s Pass, which at 920 meters is the highest of only three roads crossing the Southern Alps. The Maori people first passed through here in search of the precious West Coast pounamu (greenstone). The pass is named after Sir Arthur Dudley Dobson who led the first Europeans across here in 1864. 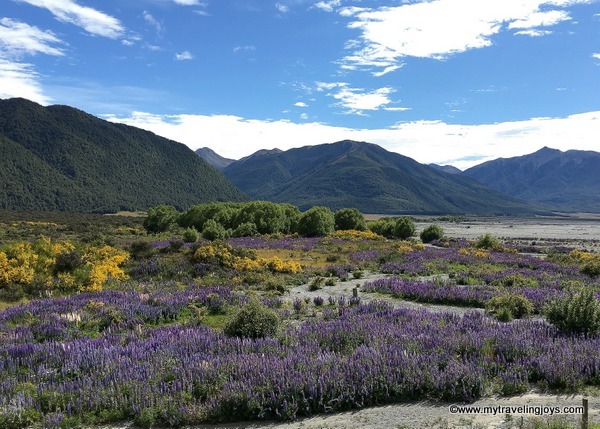 As soon as we descended from Arthur’s Pass through the 5.3-mile-long Otira Tunnel, the weather changed dramatically – from pale blue skies to overcast and rainy. We had reached New Zealand’s West Coast, which is classified as a cool-climate rain forest and known for this type of weather. We could barely see Lake Brenner, the island’s largest lake in the northwestern part, through the London-like fog. 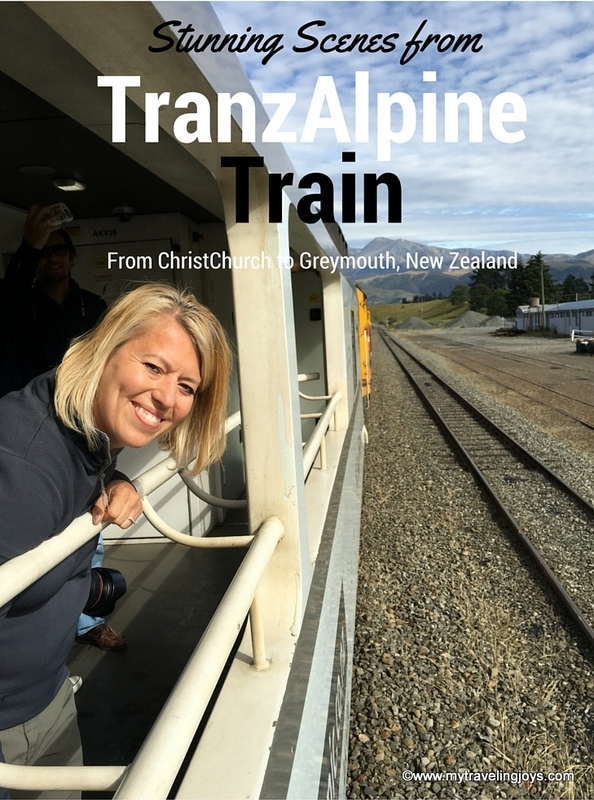 Riding the TranzAlpine made me want to do more train trips! I think this is a fantastic and low-key way to see the countryside. New Zealand simply seemed filled with picture-perfect landscapes everywhere we looked. I’m already hoping we can return and explore some more! *The 4.5 hour train ride costs 189NZ (about $126USD). I think there may be cheaper tickets if you can book further in advance. *I reserved a breakfast wrap and gluten-free berry smoothie in advance. Cost: 14NZ (about $9USD). *The train also departs from Greymouth every day at 1:45 p.m., heading to Christchurch. *We reserved a rental car in advance through the local Apex Car Rentals and easily picked it up at the Greymouth train station. Cost: $234NZ (about $150USD) for 3 days. I liked that they did not charge a one-way drop-off fee like some companies do. 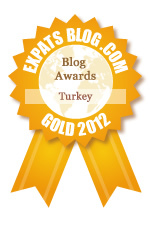 Great post, Joy, and fabulous images! We have just returned from a trip to New Zealand; it certainly has the most stunning scenery! One of the world's most 'what' train journeys I wonder, Or is that just Kiwi speak. Sorry Annie, Thanks for pointing out my mistake.